It has become increasingly clear this week that the Tory and Labour rightwing, Guido Fawkes-enabled, witch-hunt of Labour Cllrs and MPs, is targeting Muslims. This is based on two assumptions – one of them racist, the other classist: the witch-hunters reason that as Muslims their sympathy must be with the largely Muslim Palestinians, and it is no more than an expression of tribalism, of blind loyalty to the Muslim ummah. They also reason that the fact many hail from northern towns and were attracted to the Labour party, they will lack a cosmopolitan finesse and circumspection, and will be poorly educated; in short, they will be ignorant and irrational. They, therefore, conclude that during Israel’s devastating war on Gaza in summer 2014, Labour Muslim MPs and Cllrs will have felt sympathy for the Palestinians being brutally slaughtered in their hundreds, and having no control of their emotions, will have uniquely expressed an outrage that crossed a line. The majority of the Facebook posts and tweets Guido Fawkes has unearthed in the course of trawling social media accounts, were shared in July and August 2014. July 8 – August 26 were seven distressing weeks of war on a besieged, overcrowded Gaza strip, and only the ideologically-blinkered were left unmoved at the sight of the preventable deaths of hundreds of children. For the rest of us, the total impunity Israel enjoyed was intolerable: it was a period of intense emotions. Many wanted to do something to halt the massacre: tens of thousands mobilised to march on the streets of our cities, and hundreds organised acts of civil disobedience and direct action outside government buildings. Read further & see more pictures here. 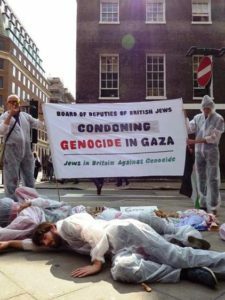 But many more felt increasingly angry and helpless, and inevitably some took the Board of Deputies at their cynical word: that this unelected body represented the views of all British Jews. All of those with a keen sense of injustice could see the hypocritical stance of our government that, given the right political foe, could galvanise in a matter of days or weeks to impose sanctions or debate commencing a bombing campaign. I congratulate my hon. Friend the Member for Rotherham (Sarah Champion) on securing this very important debate, and it is a great honour to serve under your chairmanship, Mr Chope. I will keep my speech very brief. The hon. Member for Brigg and Goole (Andrew Percy) referred to a doll. I would argue that people do not need dolls to promote hate and violence. What we have before us in Israel and Palestine is children between the ages of nine and 12 experiencing discrimination. I have children of my own who are aged eight and 11, but I cannot begin to imagine the trauma and the stamp on Palestinian children’s brains and hearts of hatred towards the Israeli military as they grow up and face discrimination, as well as the way they are treated in custody. So I would argue that we do not need props. Only recently, Shin Bet told the Israeli Government that Abbas was not encouraging terror and was actually promoting peace. So, I disagree with my hon. Friends when they say that the Palestinians are promoting this kind of propaganda. No, I will not, because I will not speak for long. As a former chair of a mental health charity and having my own children, I really struggle to understand why the Israeli Government and the world are silent on dealing with the trauma that these Palestinian children are growing up with. Surely we know that hate breeds hate; laws aside, that is just common sense. There are children who are blindfolded and tortured. We have got evidence before us. How can my hon. Friends ignore that? How can anyone even present a counter-argument to it? We are talking about the basic humanitarian right of children, which we in this House have signed up to, and we must support these children with conviction. There should be no excuse for taking children aged nine away from their homes, detaining them and sending them to prison. That is absolutely unacceptable. Naz Shah’s intervention asks that common sense prevail and international laws and human rights conventions we have ratified be respected – it is an articulate plea that we stop ignoring what is an outrage to our shared values. She was joined in her condemnation of Israel by a number of non-Muslim colleagues. How then did ‘Labour Friends of Israel‘ Vice Chair, Louise Ellman MP respond? I note my hon. Friend’s comments that a child should not be detained, and I assume that she means in any circumstances. Suppose a child was involved in an act of violence that resulted in the deaths of other human beings. That is what has happened with young Palestinians throwing stones—people have been killed. In those circumstances, surely she thinks that there should be detention. I will respond very briefly. The fact is that the disproportionality of someone throwing a stone or a rock and being detained for it is not acceptable. That is the reality of what is happening with children. You can read the debate in full here. Naz Shah MP is not filled with some kind of irrational hatred, but is knowledgable about our obligations under international laws, and rightly impatient with the justifications provided by Israel lobbyists like Ellman, for what are clear violations. Naz Shah, rather than feel angry and helpless, has channeled her righteous outrage into her work as an MP, since her election in May 2015. In April, she made a similarly impassioned intervention on behalf of child refugees during the Alf Dubs amendment debate. Finally, the real outrage and offence – as Naz Shah and others have identified – is caused by our government’s failure to uphold international laws. The State of Israel has for decades been in violation of so many UN resolutions they are too numerous to list here, and has ignored a 2004 International Court of Justice advisory opinion that its Separation Wall is illegal, yet faces no threat of sanctions. So we are left with the question: who and what has caused real harm and offence, and where should our outrage be directed?